Bective was founded in 1147 by Murdach O’Melaghlin, king of Meath. It was the first house to be colonised with monks from Mellifont. The Latin name of the abbey is a straightforward religious formula: ‘Beatitudo Dei’, the blessedness of God. In 1186 Hugh de Lacy, who had been a munificent benefactor of both Bective and the Augustinian abbey of St. Thomas’ in Dublin, was murdered at Durrow. Both houses were keen to acquire his corpse and in 1196 his body was buried in Bective abbey, his head being placed in St. Thomas’ abbey, Dublin. This led to a dispute between the two abbeys; it is thought that the feuding monks were more concerned about the lands conferred upon Bective abbey along with his corpse, rather than the actual remains of Hugh himself. In this instance burial and endowment were closely entwined. In 1205 Simon Rochfort, bishop of Meath, with two judges decided that St. Thomas had the right to the body. In 1217 the abbot of Bective was involved in the riot of Jerpoint; he was further charged with imprisoning a man in a tree stump until he died, for which he was committed to Clairvaux for trial. In 1274 the community considered moving to a new site, from Meath to the diocese of Cashel, but nothing ever came of this proposal. Instead the original church was abandoned and replaced with a new stone structure. 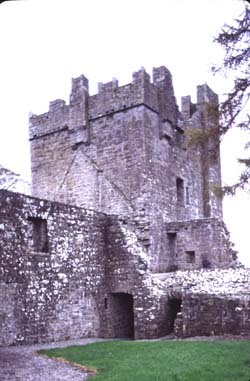 Bective was in an area of heavy settlement following the Anglo-Norman invasion of Ireland and in 1228 the abbey was described as a strongly fortified place to which visitors from England and mainland Europe could come in relatively safety. The abbey was secured so that it could better assist Clairvaux in subduing the monks of Mellifont and Boyle, who were the main agitators in the ‘conspiracy of Mellifont’ (1216-1228). During the fifteenth century there was a significant decline in the number of monks living at the abbey. A drastic reduction in the cloister took place; as only a handful of monks remained at Bective this was a practical and realistic modification. The south aisles of the church were also demolished and the adjoining arcades blocked off. The nave was further truncated by the construction of a new west façade, protected by a fortified tower. Another tower was erected at the south-west corner of the cloister, which dominated the abbey buildings. By the time the alterations were completed Bective had become the most heavily fortified of all the Cistercian monasteries in Ireland. At the time of the Dissolution the abbey had an annual income estimated at £83, which can be compared with the smaller English houses such as Buildwas and Croxden. The house was suppressed in 1536 and following dissolution the goods and chattels were sold off, yielding £108. The profits raised from the sale of goods from most other Cistercian houses in Ireland ranged between £10 and £20, suggesting that Bective was in fact relatively wealthy. It is thought that in many cases the monks must have hidden or sold possessions before the royal commissioners arrived, and at Bective it was discovered that the last abbot, John English, had carried away goods to the value of £35. Following the closure of the monastery the community retired to some obscure residence in the neighbourhood. In 1540 it was reported that the abbey roof had been demolished in order to provide material for the repairs of the king’s mill at Tryne and that the hall. From 1537 the site was given over to Thomas Agard, an English civil servant employed by the Dublin government. He constructed a massive Tudor mansion around the two sides of the old cloister court, and although it incorporated the two towers, it was not designed for defence. There are extensive ruins of the abbey and mansion at the site, although it has a feel of a fortress rather than a monastery. Nothing remains of the twelfth-century monastic buildings; the earliest stone work dates from 1274, when the abbey church was rebuilt. Only five bays of the south arcade survive from this period and these are much disfigured. The principle remains are of the claustral and conventual buildings that were reconstructed in the fifteenth century, indeed, Bective has the best preserved of all the Cistercian claustral ranges in Ireland. A piece of sculpture remains in the south range of the cloister, depicting an abbot kneeling on one of the cloister piers. It is thought that he was probably the abbot responsible for building the cloister. The cloister contains at least one other carving, this time of a bishop, which is now built into the tower of a modern church at Johnstown, County Meath. A Book of Hours, dating from the mid-fourteenth century, also found its way into the monastery. The so-called ‘Bective Hours’ is thought to have been a private book of one of the monks. The sixteenth-century mansion was used in the filming of the movie Braveheart, chosen because of its castle like qualities. The ruins are situated on pasture land, about fifteen miles from Mellifont, on the banks of the river Knightsbrook. They are readily accessible to the public.